July 24, 2015 / FOIMan / Comments Off on Safe space under threat? 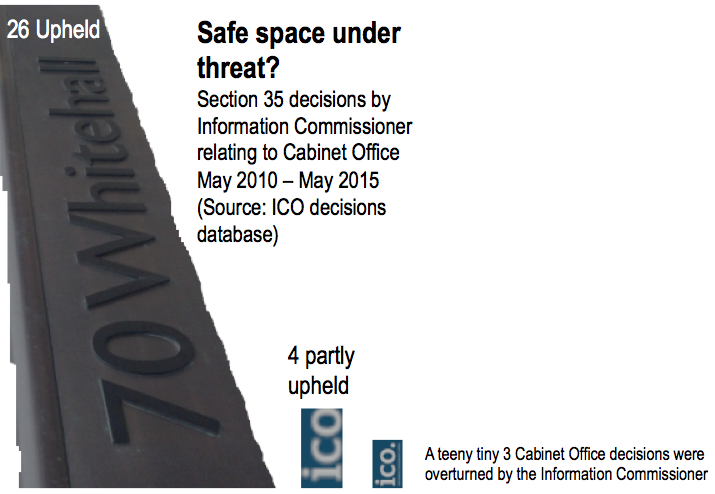 Last week an FOI Commission was set up by the government, and one of its aims is to consider “whether the operation of the Act adequately recognises the need for a ‘safe space’ for policy development…”. The section 35 exemption described in the last Exemption Index post can only be used by central government and it is designed for exactly that purpose. The Commission may find the image above helpful in reaching a judgment. and information relating to the takeover of Rowntree’s in 1988. The post above was a bit of an experiment, prepared in a hurry. It was only afterwards that I realised that the figures here are just the tip of the iceberg. In other words, the use of the exemption for policy development and formulation, protecting the safe space which the government believes to be under threat, went unchallenged 93% of the time. The three cases that the Commissioner overturned represent approximately 0.6% of the use of s.35 by the Cabinet Office. (Taking into account the partially overturned cases, it rises to 1.5%). I should also say that the reason I selected the Cabinet Office was that they use this exemption more than any other government department.